While I'm out for a stroll, I decide to see if I can find the office of Our Roots Jewish Information and Tourist Bureau. (In two days, they'll be taking me on a tour of northeast Poland.) They share a building with several other Jewish organizations, including the Jewish Youth Club, the Association of Jewish War Veterans, and the Ronald S. Lauder Foundation. Unfortunately, by the time I reach their office, they've all gone home for the day. Fortunately, their office is adjacent to the Nozyk Synagogue, the only remaining active synagogue in Warsaw. 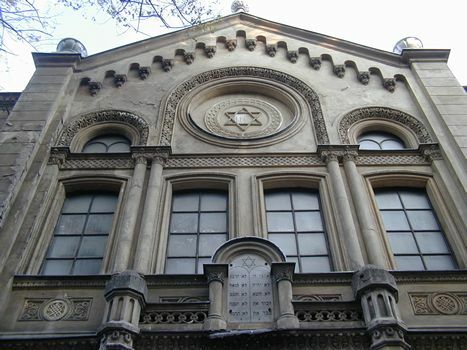 The synagogue, founded in 1900, was designed to seat 600 worshippers (300 men and 300 women, in separate sections), although the congregation is much smaller than that today. During World War II, German troops used the building as a stable, causing considerable deterioration  and the structure was further damaged during the Warsaw Ghetto Uprising of 1944.